Several times throughout the Marvel run, Hawk appeared in a recolored uniform based on his V1 uniform. This was usually before he was promoted. It was black over olive drab, instead of solid olive drab. 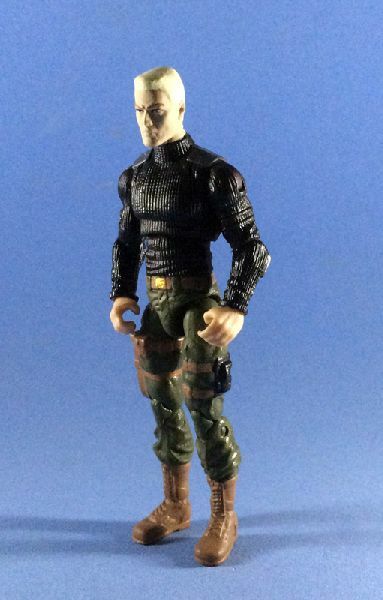 This was a look I'd all but forgotten about until joeaday.com ran a review of a factory custom ("General", by Red Lasers Army) based on the design. 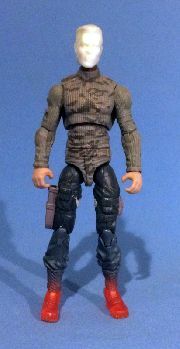 A few customizers, especially kwinn_lives, have also done some great customs of it. This custom was originally to be done in ARAH format, but the modern era commando vest was too perfect to not use. The comic pack ARAH Hawk head is a favorite, really capturing the Marvel look, so I stuck with it. The head is cast. The screw insets on the legs have been epoxied smooth.